Hi~! all! We’ll take you to the wonderful snow wonder world~! Sobaeksan National Park! magical silver snow field! find a hill to enjoy nature slope! 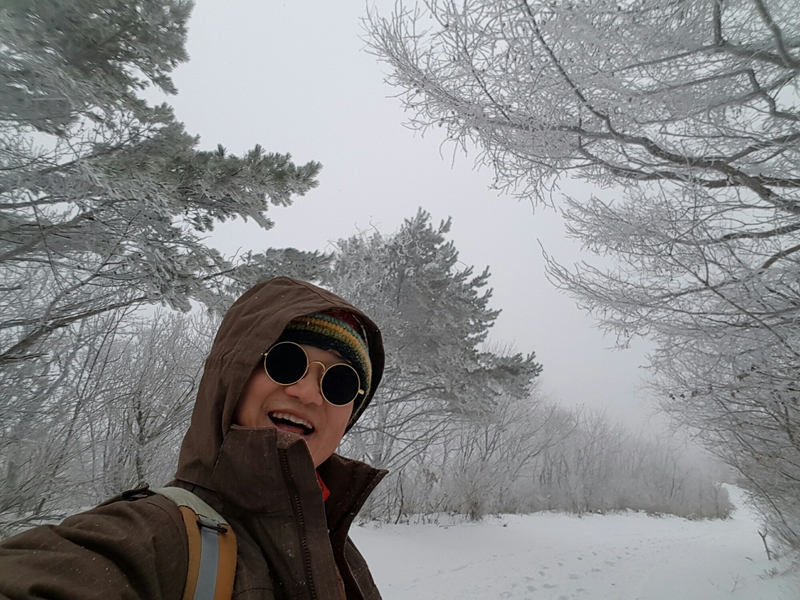 Hiking in snowy mountain is so beautiful and to open eyes to see them is just to make you feel wonderful,under the icy bluish white sky the snow is reflecting like an cubic stone in mountain! 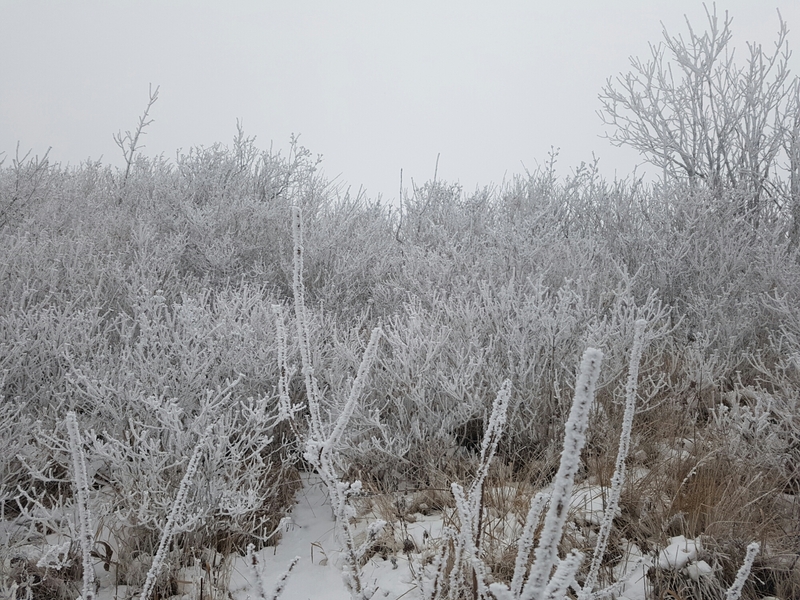 Let’s enjoy crunchy,crunchy snow hiking! The bus will take you to the ridges almost 700meter high,so there is no steep hill at all. we all just follow the trails to the peak, we can find the shapes of earth,jupiter,saturn of solar system as this mountain has the first modern star observatory on the top. 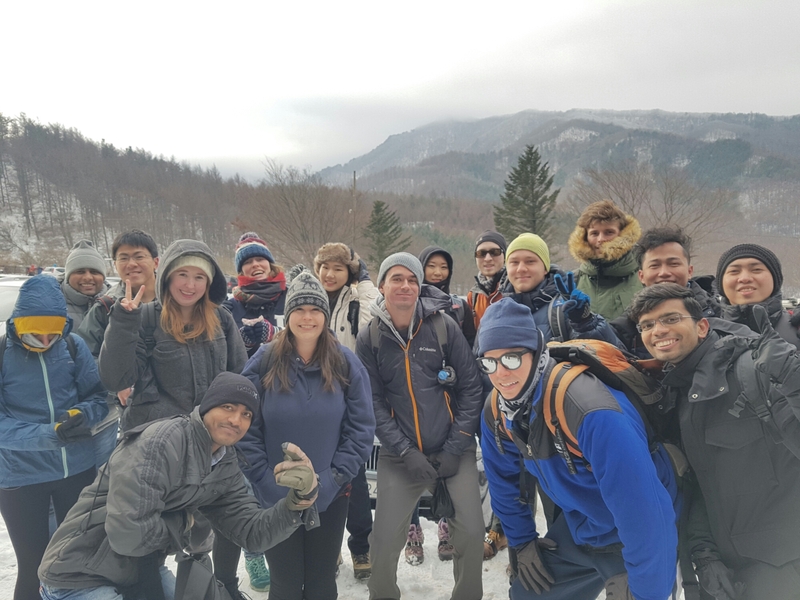 The beautiful snowy ridges,stunning panoramic view is just like the hike to snowy swiss! * Depending on how much snowed, the trail might be changed for safety! 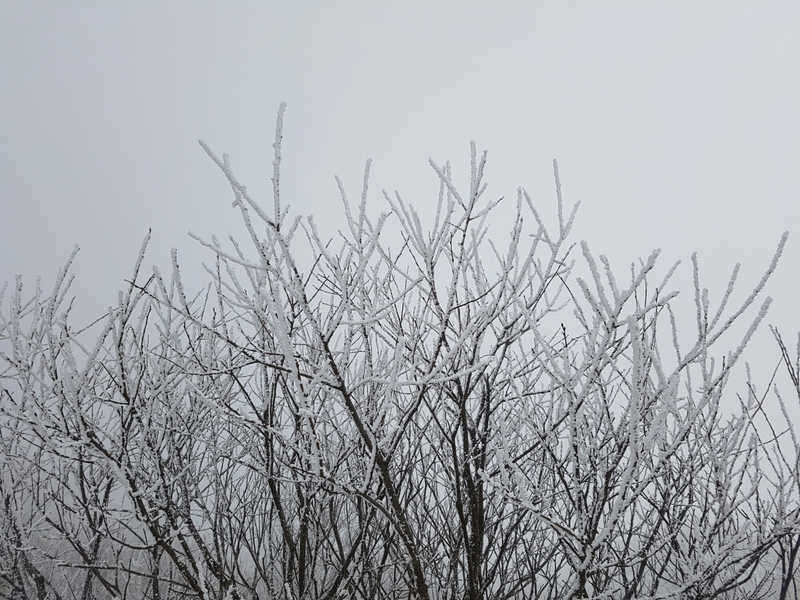 1. snow flowers : at mountain, the wind is cold enough to make snow frozen on the branch and it’s snow covered white tree and the white tree is so-called snow flowers!
! it needs a plastic bag to slide down just 10 minutes instead of walking carefully for 1 hour! 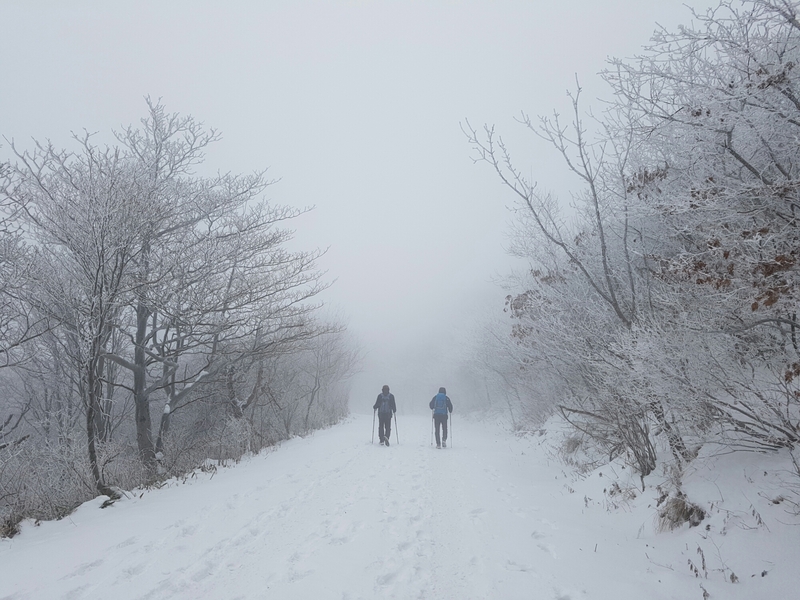 4. all the leaves gone, from the beginning of hiking, it allowes to see beautiful snow covered layers of mountains. 5. town is aching myserable cold wind, hiking in mountain is so warm. 9. All the stew,tea, coffee taste just magical in winter,yum! 10. Winter is the happiest time ever to overcome the fear of cold! feeling cold in seoul,grey city? Seriously? wear layers of clothings to take off when you get sweat! just make it sure to wear 2 jackets(warmer + wind proof) is better than 1 single thick jacket. whenever you feel warm ,zip open. Whenever you feel cold have extra layer. [♣ isn’t it slippery?] crampons-detachable spikes will be prepared for everyone! enjoy the nature as it is. 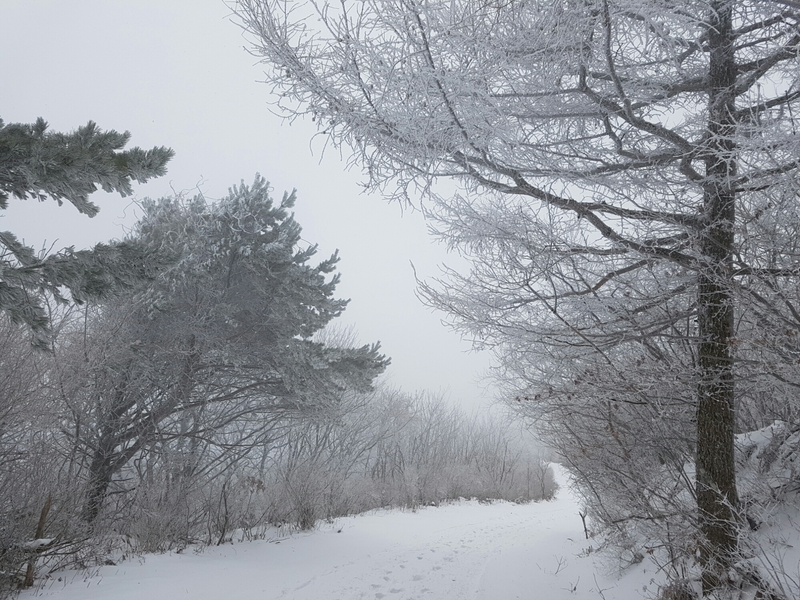 Hiking on the snow-paved trails is much more smooth and good to your knee.It’s all russelled and hardened snow,so it’s much feel comfortable and easy to walk! Seriously? snow covered concrete in city is killing people. 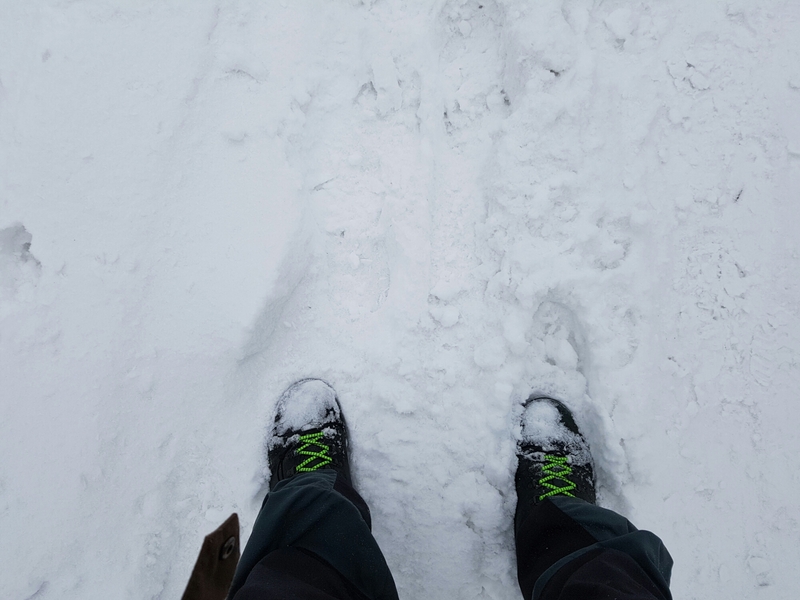 walking on snow on the dirt trails with crampons is not slippery! deposit 5K won,5K won will be refunded afte you return crampons. However,when someone lose a crampon or crampons or break them, the deposit will not be refunded. 2. pack in 20 liter(eastpak size),snacks while hiking! 3. Warm tea,warm coffee, instant coffee,meal with hot water with thermo is so great, taste of heaven! 4.We prepare stove and burner to boil water! bring your own water and coffee! 5. you can leave stuff on the bus, bus is secure. – We have always spots except when title says “FULL”.so,Don’t worry to join and request a spot. – Important! This trip is limited to the first 42 people, so please,hurry to sign up! FIRST WIRED, FIRST CONFIRMED~! 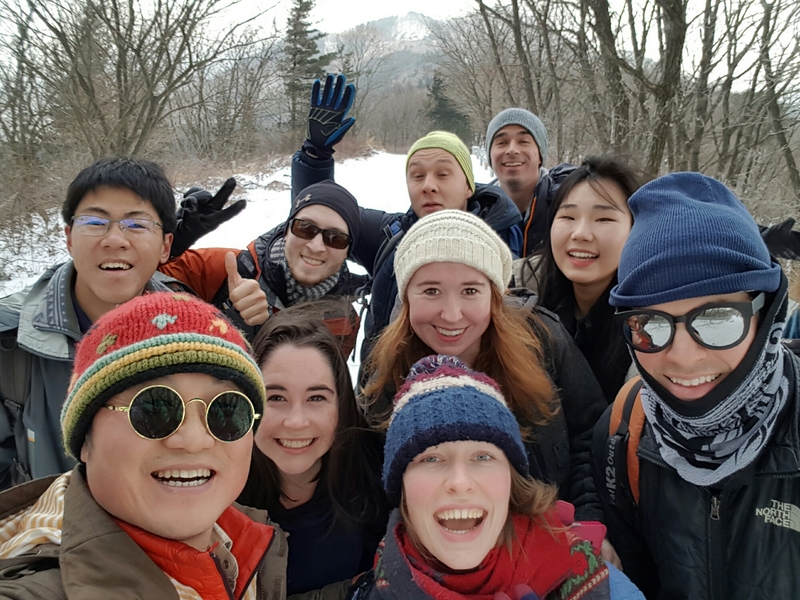 1) Join Seoul Hiking Group then RSVP on the event. – the fee is including chartered bus, fee to driver, toll fee,trip leader. -[45,000won] pay face to face on the day only if spots available. You can go to any bank and ask banker that you need to transfer money to “kookmin bank,762301-04-223562 김승일(Seoul Hiking) “.You can use also ATM machine with card or you CAN ASK to your co-workers and friends. ♣ BUS PICKUP : Bus does not wait for the late as the bus has itinerary for next place. Please,come 20 minutes early to drop by toilet,say hello to others,buy snacks! 10AM hiking trails, details of hiking trails will be informed again! find a place to have dinner together! Bibimbap,Pajeon, Beef stew with Makgeolri! Getting back to Seoul around 7PM depending on traffic. *IF you fail to show up, you will not get a refund.